The Blockchain Technology is not restricted to cryptocurrencies only. After many years of its launch, it has proven itself as an innovative technology that is influencing the richness of cryptocurrencies available in the market. Notwithstanding this technology is declared as a trend for this generation. Still, it has been failed to attract a large number of users globally. A huge number of users are not tech-savvy, they find Blockchain technology really hard to understand and are also not interested to know how this procedure works. Users, along with the Industry, will take time to gradually adopt and to get accustomed with it. Blockchain lets cryptocurrency investors and users do the transactions very smoothly. The technology is targeting wiping out the bottlenecks experiences users face by using traditional or fiat currencies, like the involvement of a central regulating authority. And such involvements require huge manpower and resources. Blockchain lets crypto money traders and users manage payments and its receipts carefully. Since many people don't know how this functions. Users are suspicious about its usage, which make it difficult for them to adopt Blockchain service. In spite of the fact that change is good, people are not willing to accept it frequently. Because accepting a new technology is not that easy. In every sector of life, change irritates a large number of people. This happens because generally, we make ourselves comfortable with our comfort zones. The acceptance of new technology is not special. When people are used to with traditional or fiat money, and the idea of electronic money sometimes feel foreign to them and seems odd. The blockchain technology and its advantages are yet to trickle to the business community, with users yet to make themselves comfortable with this unknown administrative authority. Maybe, an increasingly well-settled structure will assist users with accepting the creative blockchain technology and the assertive change its impacts, for instance, transparency in exchanges. The crypto space has the drawback of having no control, and this is an issue with cynics who think that electronic money is a bubble which will burst soon. This has diminished the blockchain acceptance rate as users regularly refer to nonattendance of principles and rules, which make cryptocurrency safe to perform exchanges. Another obstruction preventing blockchain innovation dissemination is the absence of appropriate knowledge on the revolutionary technology. There has been a ton of unfamiliarity and false information with a large number of people considering the technology is restricted to cryptographic forms of money and the monetary segment. Business community people are unaware of the fact that the blockchain technology cuts crosswise over ( can intrude in ) different sectors?—?from travel, medicine, and agriculture business, and numerous others. Accordingly, there is a requirement for appropriate training to enable users to adopt the utilization of this creative technology in their daily lives. The blockchain is an awesome innovation that offers a guarantee of decentralization, security, and transparency in different sectors. 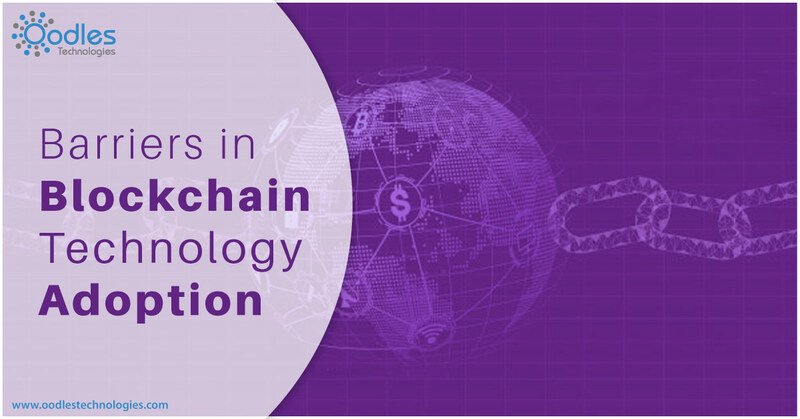 For high-end Blockchain technology services, get in touch with Oodles Technology, we are well-known Blockchain service providers around the globe.